"It's like, how much more black could this be? indie filmmaking, digital technology and general weird stuff. 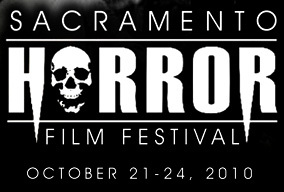 First the good news - my short horror movie, Enter the Dark will be playing at the Sacramento Horror Film Festival, Friday, Oct 22nd as part of their shorts program that starts at 5:00. Myself, my wife and a number of folks who worked on the movie will be caravanning up to Sac to enjoy the evening. If you are in the area, please stop on by! I know there has been a lot of Enter the Dark news of late and I never intended for this blog to become just a marketing machine for my indie movies, but that's what my brain has been wrapped around for the last few months. 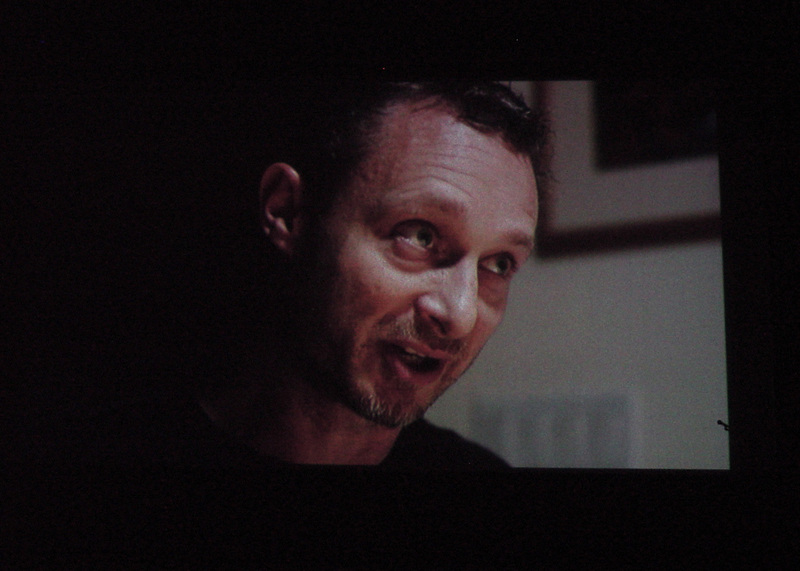 My intent was always to present my honest opinion of things that interest me, and right now that's been writing, shooting, editing, and now screening my horror movie. I've tried to give you a little insight into that process, and into the indie scene in general. Enter the Dark has been fortunate to have been selected by three film festivals and has had a number of positive reviews so far, but as with everything in life, that is not the whole story. I give you now the complete unadulterated truth that most filmmakers will try to hide. Of the ten festivals that I've entered and have made their selections so far, seven of those have said no to us. That means that 70% of the festivals that saw our movie, for whatever reason did not have a place for it in their lineup. Was our movie poorly made, misunderstood, or did it just not fit into that festival's focus this year? We'll never know - no one ever says. As a filmmaker you just have to keep plugging along and be happy that any festival has selected it - that someone has given it a home. I have yet to hear from six other festivals that I've entered, and I'll probably enter in at least 15 more within the next year. My total expenses for entering into festivals will run over $1,200 (entry fees, postage, DVDs) and if I'm lucky enough to get selected and decide to attend any of those festivals I will incur further expenses - travel, hotel, printing of posters, t-shirts, post cards, business cards, and making Blu Ray discs or HDCAM masters for the screening. We've had seven reviews of the movie from horror blogs so far and none of them has hated the movie. This is a good thing. I've been able to pull impressive quotes from almost all of the reviews that make the movie seem like the best thing since Citizen Kane. This, of course is not the whole truth. I artfully omit all the less-than glowing parts of the reviews and focus on the one or two lines that will help to sell the movie. Everyone does this. The more ellipses you see in a blurb (you know, those magic three dots), like "...the best...thing...since... sliced... bread! ", the more the marketing team has had to struggle to carve a semi-positive remark from a scathing review. However, in the indie scene there is a kind of unwritten rule that most reviewers rarely will write a really bad review for an indie filmmaker. Most of the times if they hate it, they just won't post a review at all. That way, the filmmaker won't have a permanent Google trail of someone completely bashing their home-made little movie. If your movie is lucky enough to get onto Netflix or Amazon or iTunes however, watch out - the kid gloves come off. Now, it's the reverse - if someone likes your movie, they probably won't take the time to post a review, but if for whatever reason they hate it, they will take extra glee in savaging it in the most hateful way possible. And now that putrid pile of regurgitated hate is there for all to see. Forever. 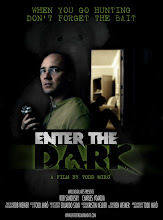 I approached 22 horror sites and blogs to see if they would be interested in reviewing Enter the Dark. Of those, 10 asked to see a screener, and of those, 7 posted reviews. So, 3 reviewers looked at the movie and never posted anything. Did they forget to watch it? Did they hate it? Did they forget to post a review? I'll never know. I do think getting 10 out of 22 to even respond to me is pretty good, and is mostly due to the fact that I had a track record, having edited and produced The Commune, which many of them had previously reviewed. 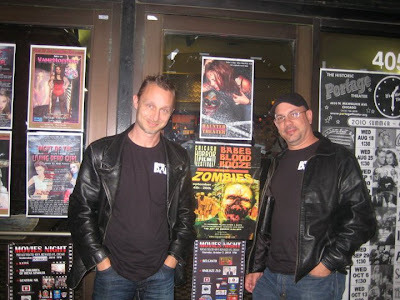 This brings me to my recent trip to Chicago, to attend the world premiere (I know, that sounds so impressive) of Enter the Dark with my good friend and co-star of the movie, Charles Yoakum. Originally, I had no intention of going to Chicago to see the premiere - it just was not within my budget, and I hoped our film would at some point play closer to home where all of us who had worked on it could attend. This is where the amazing interconnectedness of today's social networking stepped in. 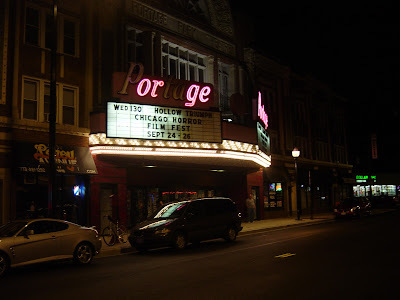 A person I had met only once, maybe ten years ago, who was a friend of a friend, saw my posting of the Chicago premiere on my friend's Facebook page and insisted that I had to go. She was so inspired by my little movie actually making it to a festival that she offered to donate her airline miles so that I could make the trip from the west coast. Wow. I was overwhelmed - how could I say no to her amazingly generous offer. So I asked Charles if he wanted to go and he said "Heck Yeah! ", or something like that, and before I knew it, we had landed in Chicago. To be entirely honest, some of my reluctance in going to Chicago in the first place, was that I just had a weird feeling about the festival. The website looked good, the lineup of movies looked good, but there didn't seem to be a lot of attention to the filmmakers. I had emailed them when I found out that we would be flying out, and asked them about recommendations on where to stay or eat in the area and got no response. Some festivals are clearly set up as a vehicle for the filmmakers to meet their audience, talk about their film, meet other filmmakers and network with distributors, while other festivals are clearly set up as fun events for the audience - the films just a part of an overall atmosphere that also includes horror-themed contests and other activities. This festival was feeling like latter. I kinda knew we were in trouble when at dinner, a couple of blocks away from the theater where our movie was going to premiere that evening, our waiter noticed Charles and I wearing our Enter the Dark t-shirts and asked what was up. When we mentioned that we had a short film in the nearby festival, he had no idea what festival we were talking about. Not good. He did however make our night as he kept asking more and more questions about our movie, and then when he realized we had flew out all the way from the west coast he remarked, "Wow - you guys are living the dream - congratulations!" It's small moments like these that sometimes make everything worth it. As we approached the Portage theater on a Sunday evening just before 8:00, I was aware of a notable lack of people buzzing around. I wanted to arrive a couple of hours before our movie screened to watch a number of the other films in the fest and check everything out. However, when we entered the newly renovated theater, my stomach dropped. In an old venue that holds almost 2,000, I would say there were 30 or so folks scattered around, politely listening to an ongoing auction of horror-themed items. The sound was echoing off the walls of the almost-empty theater. Gulp. There was nothing for us to do but settle in and hope some more folks arrived by the time our movie screened. The auction ended and they rolled into a feature-length movie and I realized the fest was running late - maybe 40 minutes late. After that movie ended, about ten people in front of us got up and left - I realized they were there just to see that film - probably the filmmakers and their friends. The emcee of the event got up on stage to announce that he really wasn't sure what was coming up next... did anyone in the audience have a schedule handy? Then someone in the audience shouted out the name of the movie that was to screen after ours and the emcee mentioned that since they were running late - maybe that was up next. That was when I almost lost it. I could handle the lack of marketing, the lack of organization, the lack of an audience, but not this. We had come all this way across the country to see our movie premiere up on the big screen and you're telling me you're going to skip over it to save some time?? NO FRIGGING WAY! I got up and started walking back to talk to someone in charge (if there was any), when they started rolling the movie just before ours. Ok, I realized, our movie should be next. I settled back down next to Charles trying to remain calm. I'm here to say that yes, our film did eventually roll up on the big screen, and the 30 or so folks that saw it actually seemed to enjoy it. They laughed at the right moments, got quiet at the right moments, and two folks audibly jumped at the climatic ending or our movie - it worked. Once that happened, everything else was quickly forgotten. I had no control over the festival - no control over how many people were there - I only had control over my little movie, and in front of a real live audience, my little vision was working. It was all worth it. So that's the hard truth. Things are never as clear-cut as they may seem, but sometimes in the end, they work out just fine. There's a chance you're eligible for a free $1,000 Amazon Gift Card. my new horror short movie. Follow my progress on this blog. Homage to The Exorcist, The Shining , Poltergeist , Alien and The Blair Witch Project . …a frightening little slice of haunted house cinema that easily stands on its own for a good old fashioned scare. … wonderfully shot and acted and the twist ending was masterfully pulled off by filmmaker Todd Miro. Watch my award winning horror short on IndieFlix today! Equal parts Rosemary's Baby , The Wicker Man , Don't Look Now & Mulholland Drive , The Commune tells a tale of entrapment, sacrifice and familial dysfunction. It premiered at Dances With Films Film Festival and has received multiple awards. I wore many hats on this project including producer, editor, motion graphics designer, colorist, re-recording sound mixer, sound designer and post-production supervisor. a broadcast documentary for PBS's prestigious AMERICAN MASTERS series. I provided motion graphics, including the main title sequence, and also did additional editing. narrated by Robert Redford, this 30-minute documentary series features intimate portraits of six passionate and dedicated activists from around the world. I edited two of the six stories, along with providing all graphics and sound mixing for this documentary, which airs on PBS and has won two Northern California Emmy Awards. Perhaps the best collection of horror short-stories ever published. The most amazing camera for under $2000. True 35mm depth of field - 24fps - 1080p. Now go make a movie! Oh yeah, you'll need to record audio too. Big deal... get one of these. Anyone even thinking about calling themselves a writer, director, editor, even a producer should own this book - and consult it often. As an editor it is invaluable as a resource for spotlighting the importance of story in a film industry that is too often allured by spectacle.